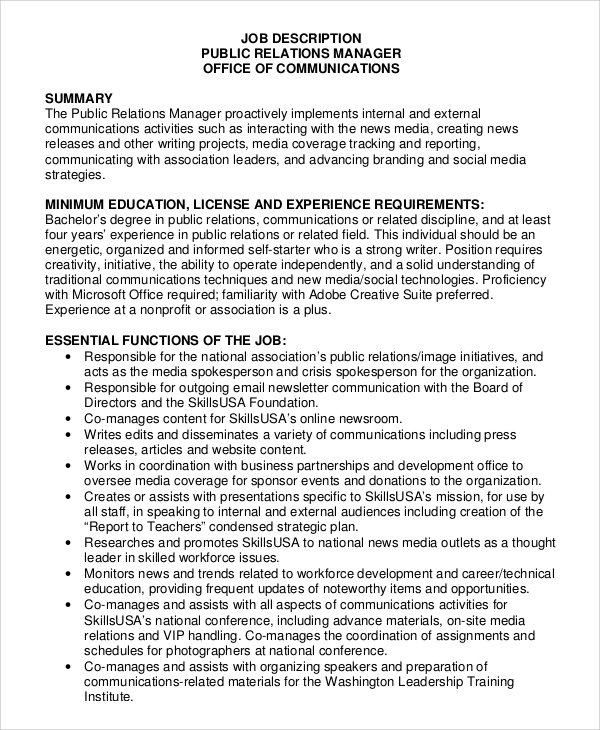 Public Relations Job Description has meticulously listed out the expectations of the organisation when hiring the ideal candidate. There are various job categories available with different levels of responsibilities, duties, specified skills, etc. Some of them require senior level professionals who can contribute substantially to the growth of the organization. The Job Description Samples is a guideline for the employee to meet the expectations of the management and also assists them in performing with a degree of independence. 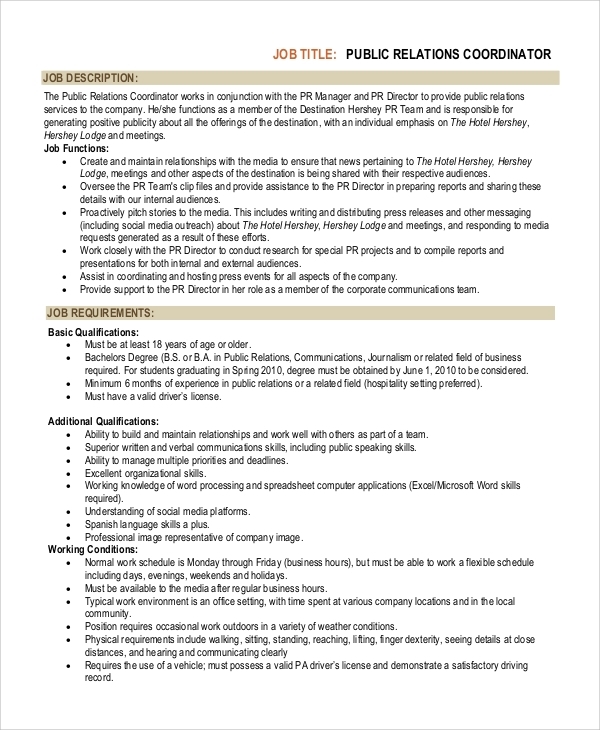 The position demands a professional with good communication skills to interact with the print and digital media, as well as draft press releases highlighting the activities of the organisation. The responsible professional in this position has to be the driving force to project the company image with a due focus on raising awareness about humanitarian issues. 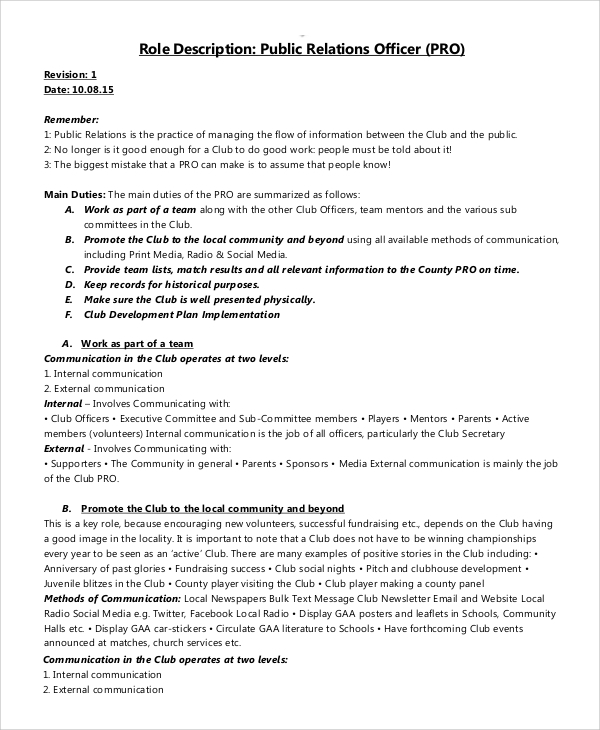 Developing and implementing communications strategy will also be a responsibility. 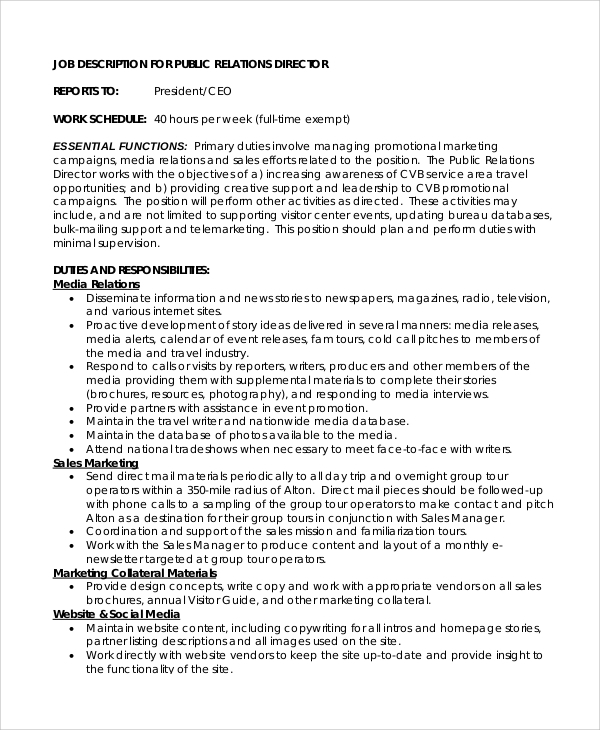 Primary duties involve managing promotional marketing campaigns, media relations and sales efforts related to the position. Personal interaction with media is part of the job profile too. 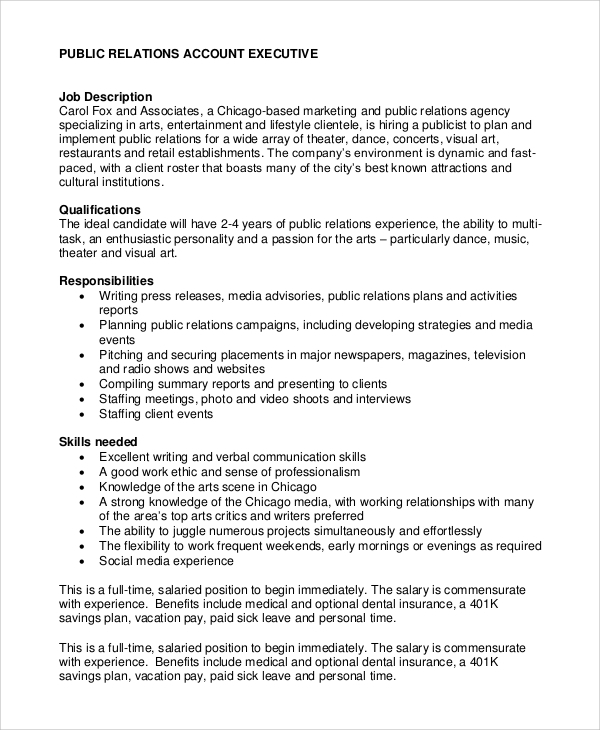 The position is for a professional, adept at internal and external communications. Also, the candidate needs to be a good team player, flexible and open to suggestions. Projecting a good image of the organisation will be the primary focus. 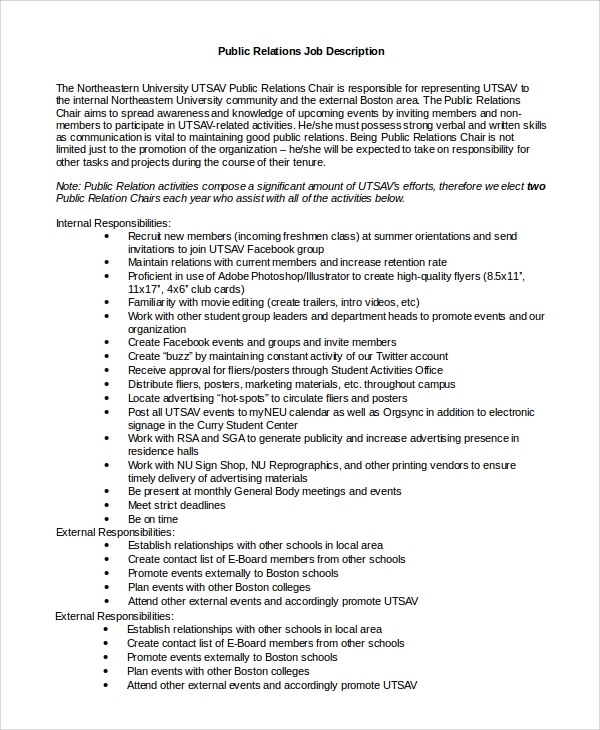 This position is meant for companies specializing in arts, entertainment, and lifestyle. The ideal candidate should possess an enthusiastic passion for dance, music, theatre and visual art. 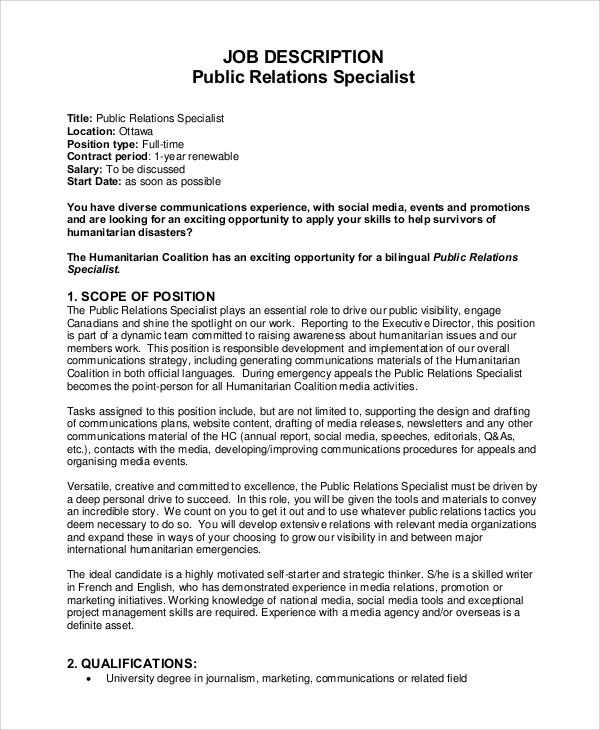 Public Relations Job Description is a company generated document carefully drafted as part of their recruitment policy and strategy. The purpose is to identify and select employees capable of fulfilling the expectations and play a key role in contributing to the growth of the organization. In a nutshell, it is nothing but a process of creating an employee profile before selection. It also serves as a tool for the employee to proceed with his responsibilities without having to refer to his superiors regularly. The descriptions play a vital role in the recruiting process. While drafting a Sample Job Description Templates, the company focuses on providing the maximum leeway permissible to allow the candidate to perform to his full potential. If the description has clarity, it further enhances the possibility of good work output, resulting in a comprehensive benefit to the organization. Candidates with relevant qualification, skills and experience only should apply for these positions. Good verbal and written communications skills are one of the attributes the ideal candidate should possess. He should also be resourceful with networking capabilities. Having an existing rapport with print and digital media will be a crucial advantage. 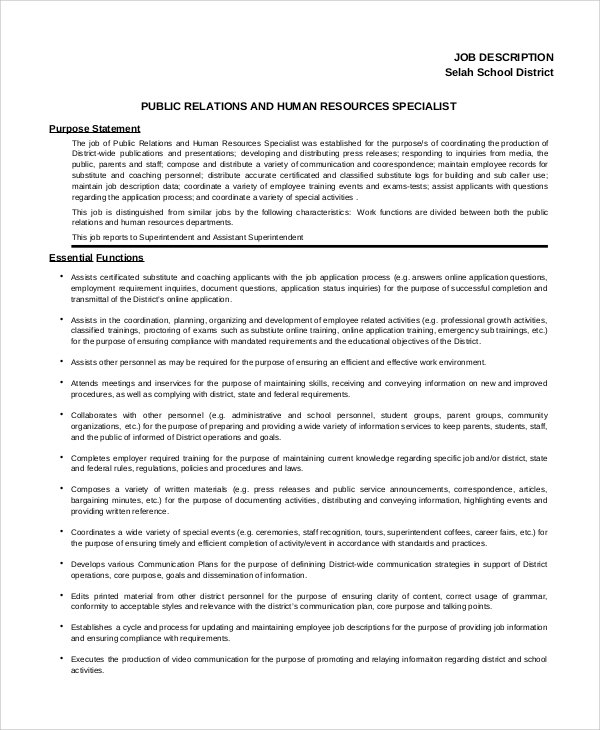 Public Relations Job Description is an important document seeking an employee who plays a critical role in portraying a vibrant image of the company to the outside world. The social image, directly and indirectly, has a progressive effect on any organization. The Account Manager Job Description Samples, however, indicates a slightly different version of the assignment.